When the McCains purchased their property in 1997, it had been used as a cattle ranch for years. The property encompasses a ridgetop and is 65 acres. It had been part of the Nicholson Ranch and parts were used for growing apricots in the 1930s-1960s. Some old apricot trees still exist on the eastern side of the ridge. Rick McCain is a horticulturist who co-founded Quail Mountain Herbs, which sold herbs and specialty produce for culinary purposes. He sold his interest in the business after 19 years after it had grown to a large business, employing 150 employees and farming hundreds of acres. He is a recognized expert in Passifloras (passion flowers) and has hybridized many Passifloras for fruit, flower and cold tolerance. After selling his interest in the business in 1997, Rick and Michelle decided to try to grow unusual and hard to grow flowers for the cut flower market. We are constantly experimenting with different plants and markets. However, Rick loves challenges. Rick grows South African and Australian plants that have either unusual flowers or unusual foliage. All of the plants are drought tolerant and can go for long periods of time without water. The flowers are sold under the name Wild Ridge Organics. The farm is certified organic by California Certified Organic Farmers (CCOF) The commercial plants are grown using drip irrigation. We use the native rye grass as a natural mulch, which protects the roots of these sensitive plants. Rick has only a part-time employee and therefore he does most everything from propagating, planting, maintaining, harvesting, and delivering himself. Sean McCain is a 22 year old college student who works on the farm as well. and Brianna McCain is an 20 year old college student. Michelle and Brianna started making Protea Wreaths, Herb Wreaths, Ornamental Oregano Wreaths, Flower Wreaths, Protea Angels, Banksia Bugs™, arrangements and other items with the flowers when Brianna was 11. Michelle grows the herbs and flowers used in the crafts. They sell their products at the Carmel Homecrafter's Marketplace which takes place at the Carmel California Sunset Center parking lot on the Saturday of the weekend before Thanksgiving, annually. Come visit us at our booth to see a huge selection of wreaths and other crafts. We sell our wreaths at special pricing during the show. The McCains have also started a botanical garden named “Lost Eden Botanic Garden”, on approximately 20 acres of land. At present, we have been putting in foundation plants and water systems. The garden will emphasize collections of rare plants from around the world that can survive in our climate. It has been a struggle to protect the plants from the deer. We are always looking for people who might want to volunteer or contribute to this effort. We hope to use the garden to educate students and others regarding these plants and to conserve and protect plants threatened in the wild. Proteas are named after the God, Proteus, the God of Transformation or Change because Proteas change in appearance from bud to dried. Most of our Proteas bloom from about October into early May. 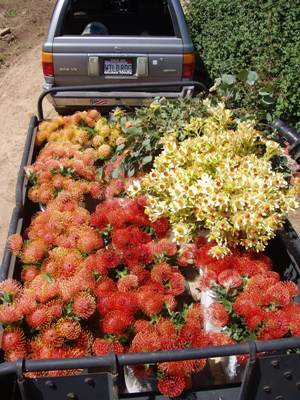 Proteas are generally very drought tolerant. Most are sensitive to frost, although some are hardier than others. In January, 2007, we lost all of our crop of flowers in the freezes, although most of the plants survived. Growing organically, we battle rabbits, gophers, and other pests as we try to bring a quality product to market. Even deer have been known to damage the plants, although for the most part, they don't seem to like the taste.